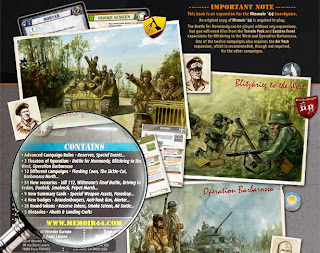 The Memoir '44 Campaign Book is the next fine extension to the base game of Memoir '44. 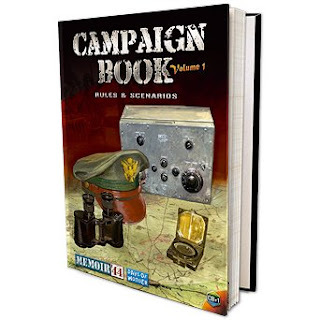 Instead of playing a single scenario (and maybe change sides afterwards) this campaign offers the possibility to play grand campaigns (also called theaters of operation) - which consist of different campaigns (and a couple of scenarios per campaign). The great thing is that the scenarios and campaigns are linked, meaning that the outcome of a single scenario determines which scenario has to be played next. Beside the base game of Memoir '44 you need the "Terrain Pack" and the "Eastern Front" extensions to be able to play through all three grand campaigns. For one of the twelve campaigns also the Airpack is required. 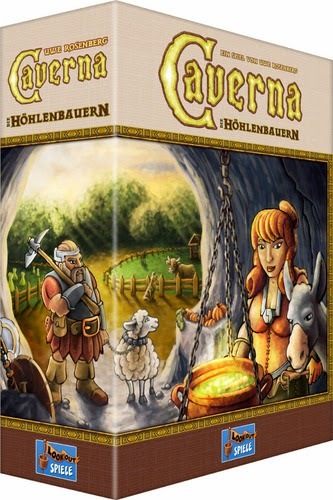 The fact that extensions are needed shows that this campaign book is full of new ideas and exciting gameplay, also some interesting rules are introduced. Additionally I want to point out that the "Eastern Front" expansion is definitely an interesting one, also if just considered to be played without the new campaign book. It contains a whole russian army set (soldiers, tanks, guns) and 8 historical scenarios - from Finland to Stalingrad and from Operation Typhoon to Barbarossa.